The Liturgy today shows Jesus going to meet his people. It is the feast of the meeting: the novelty of the Child meets the tradition of the temple; the promise finds fulfillment; Mary and Joseph, young people, meet Simeon and Anna, elderly. Everything, in short, meets when Jesus arrives. What does this say to us? First of all, we too are called to welcome Jesus who comes to meet us. Meet him: the God of life must be met every day of life; not every so often, but every day. Following Jesus is not a decision taken once and for all, it is a daily choice. And the Lord does not meet virtually, but directly, meeting him in life, in the concreteness of life. Otherwise Jesus becomes only a beautiful memory of the past. But when we welcome him as the Lord of life, the center of everything, the beating heart of everything, then He lives and lives in us. And it happens to us what happened in the temple: around him everything is met, life becomes harmonious. With Jesus we find the courage to go forward and the strength to remain steadfast. The meeting with the Lord is the source. It is therefore important to go back to the sources: go back to the decisive encounters with Him, revive the first love, perhaps write our love story with the Lord. It will do well for our consecrated life, so that it does not become time that passes, but it is time to meet. If we remember our founding encounter with the Lord, we realize that it did not arise as a private matter between us and God. No, it blossomed in the believing people, alongside so many brothers and sisters, in precise times and places. The Gospel tells us this, showing how the encounter takes place in the people of God, in its concrete history, in its living traditions: in the temple, according to the Law, in the climate of prophecy, with the young and the old together (cf. , 25-28.34). Thus also the consecrated life: blossoms and blooms in the Church; if it is isolated, it fades. It matures when the young and the elderly walk together, when the young find the roots and the elderly welcome the fruits. Instead, it stagnates when you are walking alone, when you remain attached to the past or you rush forward to try to survive. Today, the feast of the meeting, we ask for the grace to rediscover the Lord alive, in the believing people, and to make the charism meet with the grace of today. The Gospel also tells us that the meeting of God with his people has a beginning and a goal. We start from the call to the temple and we arrive at the vision in the temple. The call is twofold. There is a first call "according to the Law" (v.22). It is that of Joseph and Mary, who go to the temple to accomplish what the law prescribes. The text underlines it almost as a refrain, four times (see verses 22.23.24.27). It is not a constraint: the parents of Jesus do not necessarily or to satisfy a mere external fulfillment; they go to answer the call of God. Then there is a second call, according to the Spirit. It is that of Simeon and Anna. This too is highlighted with insistence: three times, speaking of Simeon, we speak of the Holy Spirit (see verses 25.26.27) and ends with the prophetess Anna who, inspired, praises God (see verse 38). Two young men rush to the temple called by the Law; two elders moved by the Spirit. This dual call, of the Law and the Spirit, what does it say to our spiritual life and to our consecrated life? That we are all called to a double obedience: to the law - in the sense of what gives good order to life - and to the Spirit, who does new things in life. This is how the encounter with the Lord is born: the Spirit reveals the Lord, but in order to receive him, the constant constancy of every day is necessary. Even the greatest charisms, without an ordered life, do not bear fruit. On the other hand, the best rules are not enough without the newness of the Spirit: law and Spirit go together. To better understand this call we see today in the early days of Jesus' life at the temple, we can go to the early days of his public ministry, at Cana, where he turns water into wine. There too there is a call to obedience, with Mary saying: "Whatever [Jesus] tells you, do it" (Jn 2: 5). Everything. And Jesus asks for a particular thing; it does not immediately do a new thing, it does not give us the missing wine - it could have done it - but asks for something concrete and demanding. He asks to fill six large stone amphorae for ritual purification, which recall the Law. It meant pouring about six hundred liters of water from the well: time and effort, which seemed useless, because what was missing was not water, but wine! And yet, precisely from those amphoras filled well, "to the brim" (v. 7), Jesus draws new wine. This is for us: God calls us to meet him through fidelity to concrete things - God always meets in concreteness -: daily prayer, Mass, Confession, true charity, the Word of God every day, proximity, above all to the most needy, spiritually or bodily. These are concrete things, as in consecrated life obedience to the Superior and the Rules. If you practice this law with love - with love! -, the Spirit arrives and brings the surprise of God, as in the temple and at Cana. The water of everyday life is then transformed into the wine of novelty and life, which seems more constrained, actually becomes freer. At this moment a nun, humble, reminds me that she had the charisma of being close to the priests and seminarians. The day before yesterday, his cause of beatification was introduced here in the Diocese [of Rome]. A simple nun: she did not have great lights, but she had the wisdom of obedience, of fidelity and not to be afraid of news. We ask that the Lord, through Sister Bernadette, give us all the grace to go this way. The meeting, born of the call, culminates in the vision. Simeon says: "My eyes have seen your salvation" (Lk 2:30). He sees the Child and sees salvation. He does not see the Messiah performing miracles, but a small child. He does not see something extraordinary, but Jesus with his parents, who bring to the temple two doves or two doves, that is, the most humble offering (see verse 24). Simeon sees the simplicity of God and welcomes his presence. He does not look for anything else, he does not ask for and he does not want more, he just needs to see the Child and take him in his arms: "nunc dimittis, now you can let me go" (see v. 29). God is enough for him. In him he finds the ultimate meaning of life. 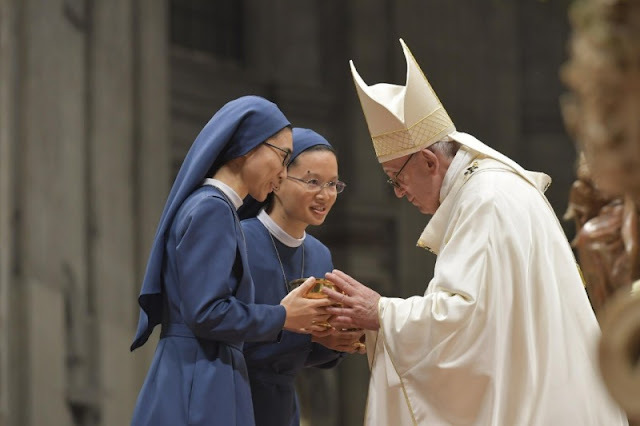 It is the vision of consecrated life, a simple and prophetic vision in its simplicity, where the Lord is held before his eyes and in his hands, and he does not need anything else. Life is He, hope is He, the future is He. Consecrated life is this prophetic vision in the Church: it is a gaze that sees God present in the world, even if many do not realize it; it is a voice that says: "God suffices, the rest passes"; it is praise that flows in spite of everything, as shown by the prophetess Anna. She was a very old woman, who had lived many years as a widow, but was not gloomy, nostalgic, or bent over herself; on the contrary, he arrives, praises God and speaks only of Him (see verse 38). I like to think that this woman "talked well", and against the evil of chattering this would be a good patron to convert, because she went from side to side saying only: "That's it! It's that child! Go see it! " I like to see her like a neighborhood woman. Here is the consecrated life: praise that gives joy to the people of God, a prophetic vision that reveals what matters. When it is so it blooms and becomes a call for all against mediocrity: against the drop in altitude in spiritual life, against the temptation to play down with God, against adaptation to a comfortable and worldly life, against lamentation - the complaints ! - dissatisfaction and weeping, against the habit of "doing what we can" and "we have always done so": these are not sentences according to God. Consecrated life is not survival, it is not getting ready to the "ars bene moriendi": this is the temptation of today before the decline in vocations. No, it's not survival, it's new life. "But ... we are few ..." - it is a new life. It is a living encounter with the Lord in his people. It is called to the faithful obedience of every day and to the unpublished surprises of the Spirit. It is a vision of what counts to embrace in order to have joy: Jesus.